I don’t know anyone who uses stem and leaf diagrams or stem and leaf plots but they appear all over the place in statistics books and web sites. 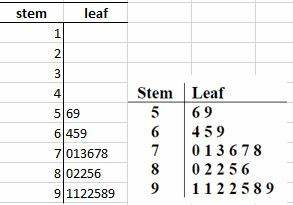 Today I read on twitter about stem and leaf diagrams and they said how difficult is to program them. 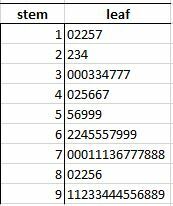 Now, I am not the world’s most astute Excel programmer but I had a go, with some success I have to say. Nevertheless, they are not easy to do in the sense that we cannot just drop the data onto a work sheet and expect a stem and leaf diagram to appear . 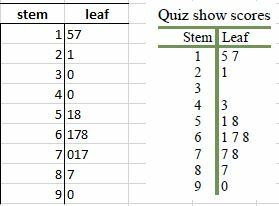 A basic set of numbers to show quiz results for some students: a screenshot of the diagram on a web site on the right and my effort on the left of it. 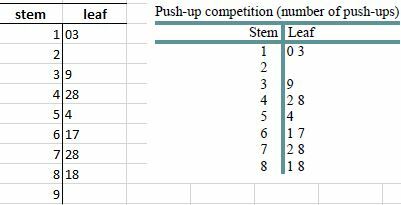 The number of press ups (push ups) done by competitors in a press ups competition! All of this uses some not very clever IF statements!